We provide individually designed curriculum to meet the needs of students with learning differences while challenging them to attain their highest potential. 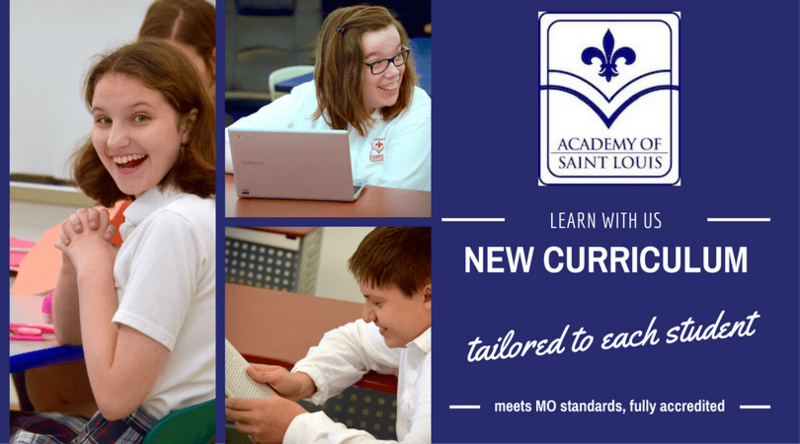 The curriculum at the Academy of St. Louis promotes an understanding and retention of attainable, challenging goals applicable to individual students while providing them with the tools to accomplish these goals. The Academy implements an individualized program that meets the needs of each student based on grade level and ability. For this reason, a curriculum is designed for each student while developing an understanding of concepts, computations, problem-solving, personal finance and consumer math. Additionally, we use a variety of materials to provide a balanced approach with hands-on opportunities and guided instruction that move students from the classroom to real-world math applications. One-to-one instruction is provided as needed by the student. Student support is increased as they move through the more advanced curriculums of Algebra, Geometry, Algebra II, and Trigonometry. Academy Language Arts Courses prepare students for college or career paths with the instruction of necessary life skills, such as writing composition, reading comprehension, and public speaking. In addition to individual instruction, students work in small groups, are encouraged to participate in classroom discussions, and availed the use of Chromebooks for research and data exploration. Additionally, our American and World Literature courses focus on the use of grammar, research projects, listening skills, vocabulary expansion, and fluency. Students learn through hands-on projects and experiments of relating investigative science skills to the real world and from textbook resources and research. In these courses, we promote many development skills, such as note-taking, understanding, and interpretation of graphic materials, problem-solving techniques, scientific experiments, critical thinking, and reasoning, which aids the development of an understanding of the world around us. Our Social Studies Courses promote the development of note-taking, understanding, and interpretation of graphic materials, critical thinking, and reasoning, which aids the development of an understanding of the history of the world around us. As a result, these courses focus on Current Events, Government, Geography, U.S. History, and World History. Students will explore both past and present events, and come to understand how each can affect and change the world around us through the use of technology and hands-on materials and projects. Our Physical Education Courses are to improve a student’s individual skills involving strength, physical endurance, and coordination. Because we encourage individual improvement, our curriculum focuses on each student’s individual abilities and goals. Therefore, we accomplish this through on-campus instruction and off-campus personal training. Overall, our intention is to instill a lifelong appreciation for physical fitness, maintain healthy habits, and develop a positive self-image. Our Religion Courses promote an understanding of the Catholic Faith and the love of God, others and oneself. This instruction includes attending weekly Mass, completing service projects, and the opportunity to partake in the Sacraments. Most importantly, each student is encouraged and aided in accepting themselves as a true gift from God and following the path that God has designed for them. Students will also have the opportunity to prepare for the Holy Sacraments. Our Catholic formation provides a positive school community and education of sound moral values for all faiths. At the Academy, Social Skills are part of everyday classroom routines. Our students are prepared with a number of social strengths, such as coping skills, etiquette, life skills, and social interaction. Leadership opportunities are availed through the Student Ambassador Program, performing at events, student to student mentoring and other community opportunities, according to each student’s ability. Each child deserves the opportunity to establish self-confidence in a safe, nurturing environment. These skills are brought to the forefront of our student’s daily schedules. These skills are gained within the classroom setting and also in all interactions throughout the school day. For more information about learning disabilities, visit our resources page.